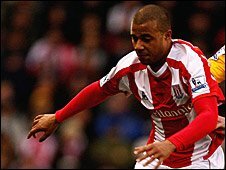 Stoke City have allowed Tom Soares and Nathaniel Wedderburn to go out on loan. Wedderburn joins League Two side Hereford United for five weeks, while Soares has gone to Championship club Sheffield Wednesday for one month. Soares, who cost Stoke £1.25m from Crystal Palace last year, has failed to make an impact since his switch, making only 11 appearances. Stoke have now got 10 players out on loan, including Dave Kitson who has joined Championship club Middlesbrough. Hereford have also completed the loan signing of another England youth international, 17-year-old midfielder Jordon Mutch from Birmingham City. Both Weddeburn and Mutch are at Edgar Street until January and go straight into the Bulls squad for Saturday's FA Cup second round home tie against Colchester United.